All artists in the contemporary context are influenced by the external conditions of our world and no one can escape this influence. These worries are reflected in artistic work, be it a singular event such as a terrorist attack or a general unease about the global situation of the world. 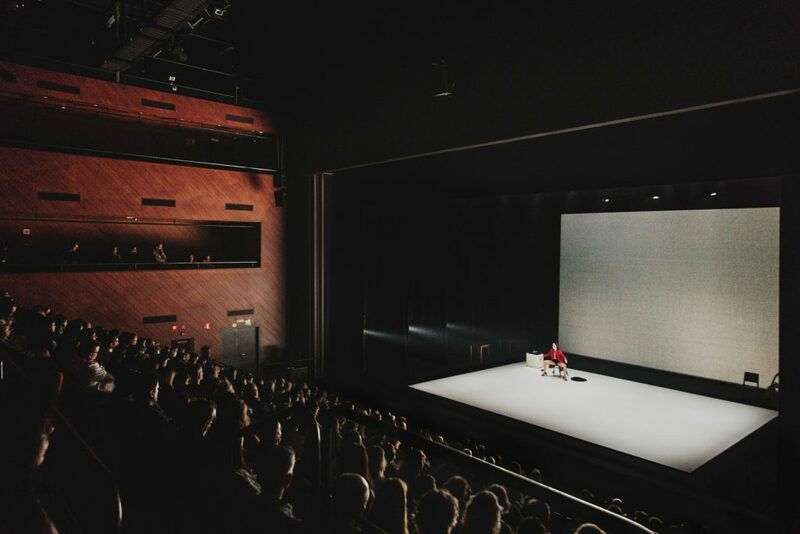 I remember a statement of Pina Bausch, the famous german choreografer and creator of the „Tanztheater“ who says: „Life today cannot be danced in the traditional way. I’m not interested in the aesthetics of gesture for the sake of gesture. I had to sacrifice my own dance to find a way to include in the movement the problems of our world“. A dystopian society is usually characterized by a dictatorial form of rule or a form of repressive social control. Typical characteristics of a dystopia are that the individual is deprived of all freedom, communication between people is restricted or otherwise disturbed, and the consciousness of one’s own history and values is cut off. 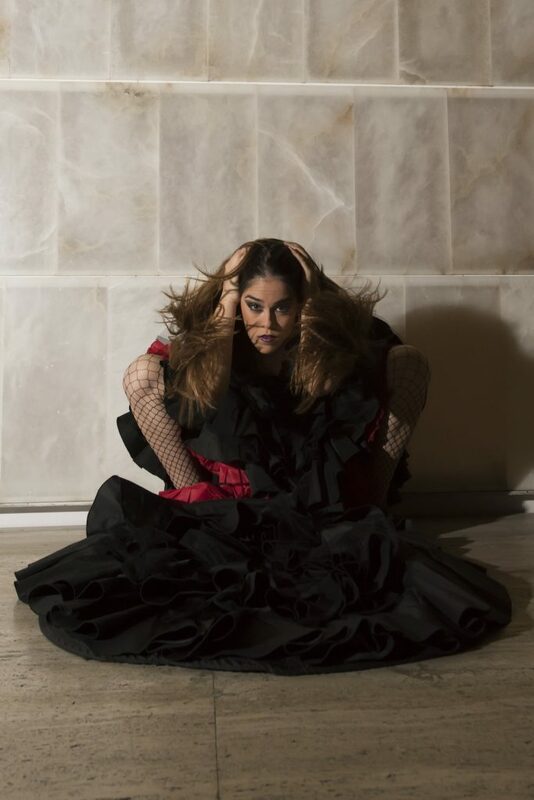 Patricia Guerrero is a child of her time and she trusted in the collaboration with director Juan Dolores Caballero, as to have an artistic director is nowadays imperative and nearly a must. In the past, when the Flamencos were on stage and interpreted one Palo after the other, this was not necessary, but since Mario Maya it should be clear that a complex stage work needs a person who understands his craft. Then the artist can concentrate on what he/she really knows. I don’t ask my tailor to repair my car either. …. 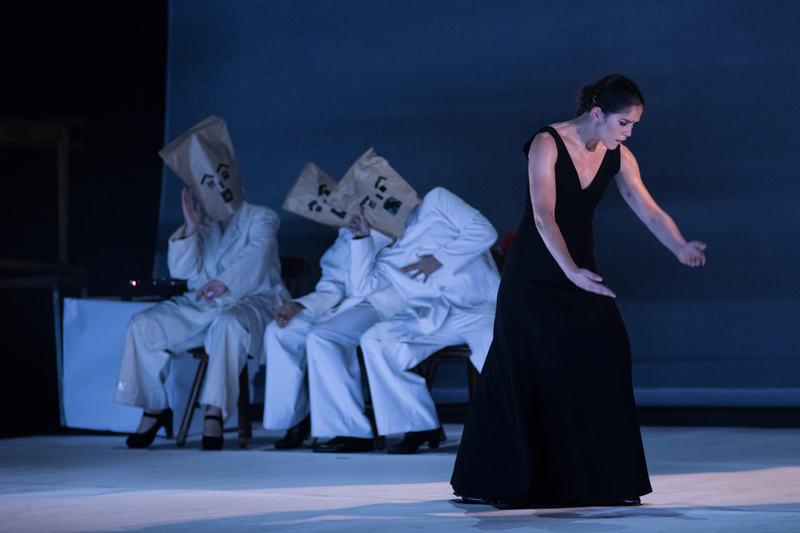 Without any doubt „Distopía“ also took inspiration in concept and aesthetics from Pina Bausch’s dance theatre, a fact that seems almost inevitable in modern dance pieces. The music of course plays a decisive role in this piece, it also shows some of the characteristics of contemporary flamenco. On the one hand the absolute freedom in the choice of music, from the traditional Flamencopalo as in the Tientos and the Alegría to parts in jazz harmonies and electronic sounds from purely rhythmic parts to the music of Austrian composer Hugo Wolf. It serves to create a certain atmosphere, to evoke associations, to create feelings comparable to a collage in the visual arts. In a musically beautiful scene of „Dystopía“ Patricia dances with one of the dancers, but before you give yourself up to the enchanting sounds, you notice that something is not right here, Patricia is not led, she is pushed, she doesn’t surrender, she is subjected, she wants to escape, but he doesn’t let her go, he lifts her up like a doll and drops her again, she resists, she struggles, but he doesn’t give in, he remains rigid in his iron will, he pulls her by the hair, she loosens her knot, strips off her dress and then he leaves, laughing with his friends, he turns around and walks away. After a moment of silence Patricia goes back, she changes her clothes and puts on a record. with „Distopía“ Patricia Guerrero takes another step forward. She forms part of what Gerhard Steingress would call „The post-modern flamenco“ where the values focus on the individual, on self-realization, personal freedom and a high sensitivity to the social and natural environment, seeking answers to the spiritual questions created by the abundance of modern life.